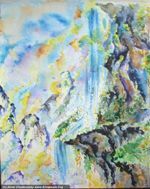 The great gift of the painting is to create bridges to your subconsciousness, to waken your creation. So I avoid to instruct you what colour exectly your need to create the same picture as mine. 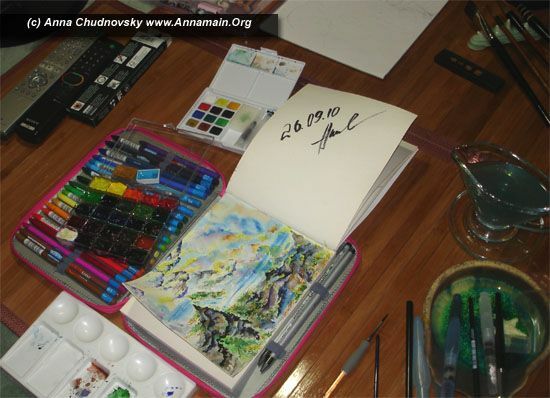 Be sure I can`t remember it because creative process is a pure meditation for me. And I wish to waken your to it. First of all make sure your place are comfortable and it`s enough place for everything - your hands, brushes, water, colours, for everything except your cat. Cats always interesting in painting and tryes to use their tails and pads as brushes. As we likes them this doesn`t sounds as a problem, but be shure: a cat likes to finish his master work somewhere on your bed clothes or business shirt. Anyway mine did it many times and I have to warn you! 1 - use water to make a paper wet. 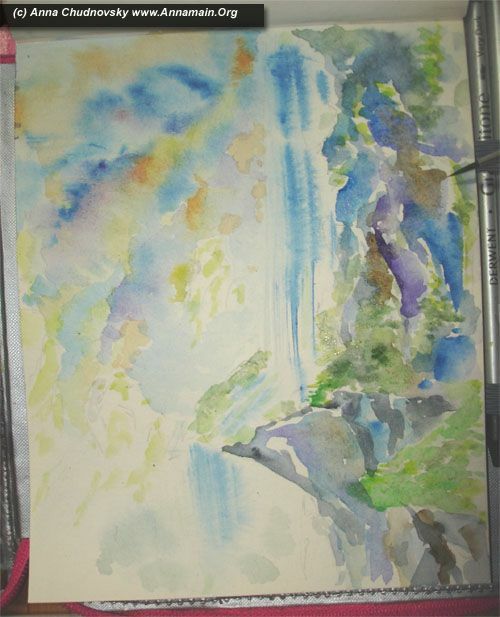 By brush with ablue colour and a lot of water make several wet strokes to make sky. 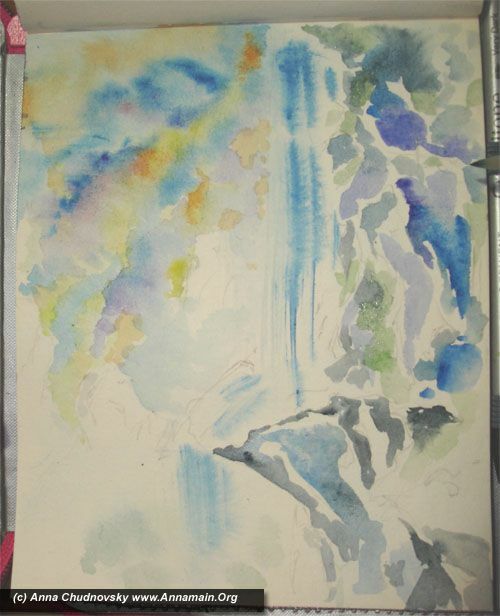 Then with dry brush take more blue and make strong strokes -this is the stream of a waterfall. 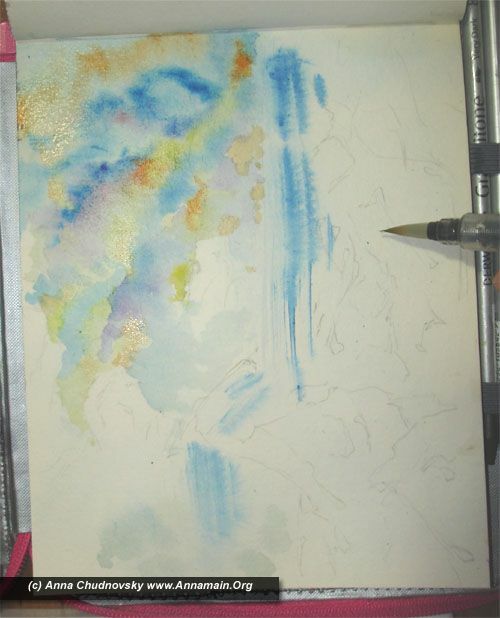 2 - you are free to use any colour you like for sky and clouds, but try to do it quickly until your paper keeps wet. 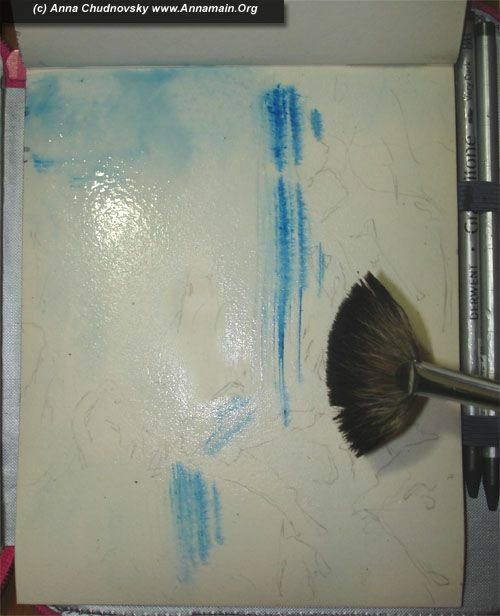 Take dark blue to make several strokes as clouds. Then use any light colour (yellow on my picture) to make several strokes near the previous. 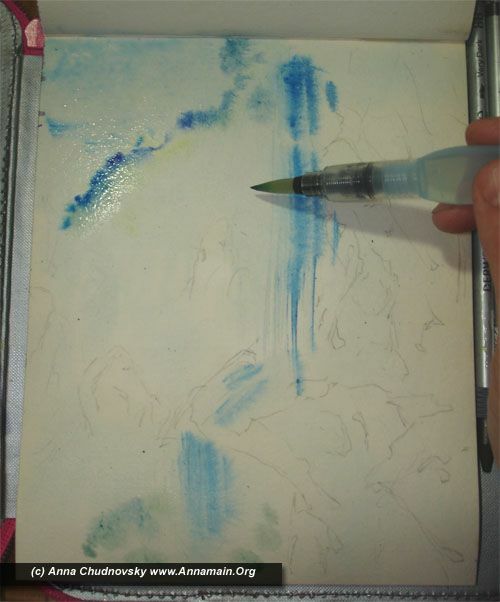 3 - Keep paper wet and make several strokes with different colours the same way. 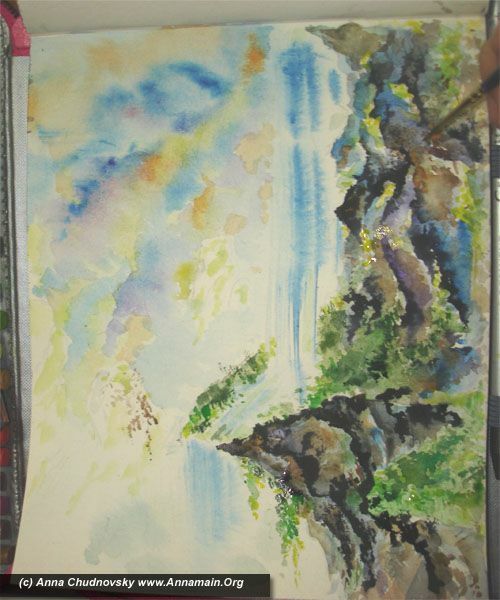 Keep your brush away of waterfall. 4 - you can choose any shadows to paint the rocks. I chose shadows of gray and dark blue, because I like it for mountings. As you like to paint another way, for exmple with shadows of brown, you should choose it and the result will be good. By several shadows of choosen colours make strokes for mountings. 5 - use several shadows of green to create the base for future grass. I prefer to make instructions the way to turn your intuition to communicate with you. 6 - use dry brush with different colours to make grass and mountings more thick. Feel it. Your subconsciousness keep every plant and stone you`v ever seen and as you feel something- do it! By points and strokes make the picture lively. 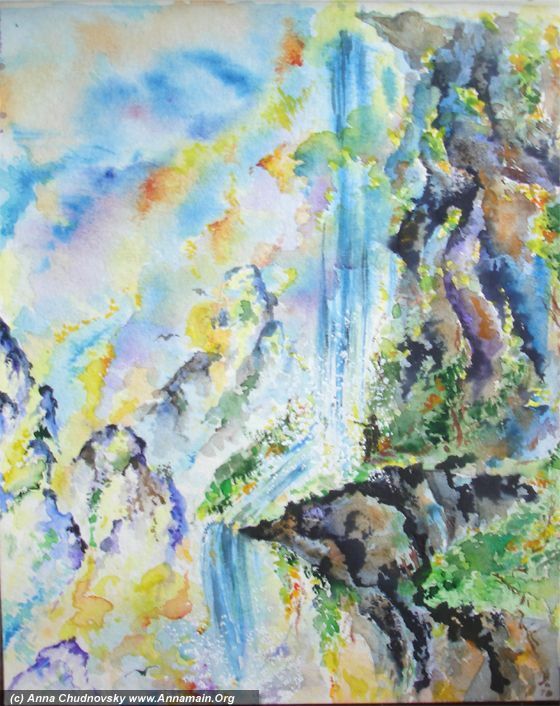 Feel how water falls, and rocks stands… see as point by point your picture became manifesting. 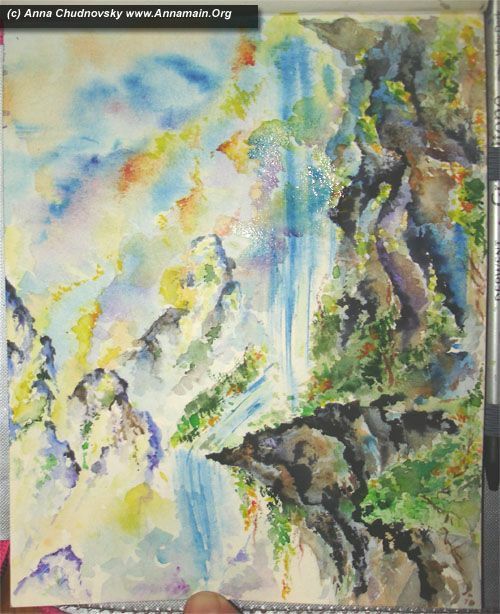 7 - the same way make points and strokes with dry brush. 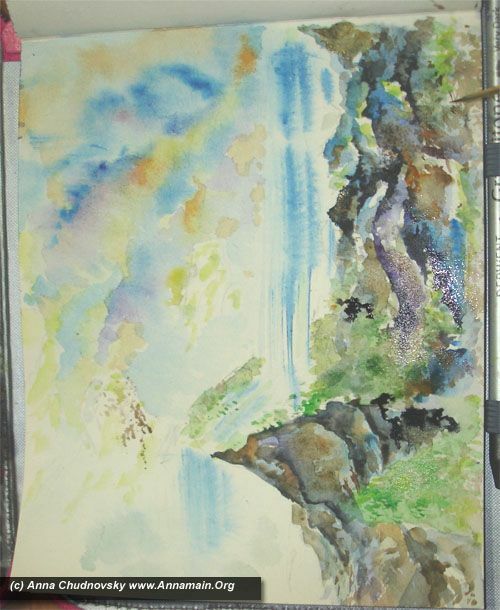 8 - with points by dry brush and colours make far mountings on the left side more clear. Use orange, yellow and lemon yellow coours to make several points on the grass at the right side of the picture. The same colours you can use to make chains of points on the clouds. 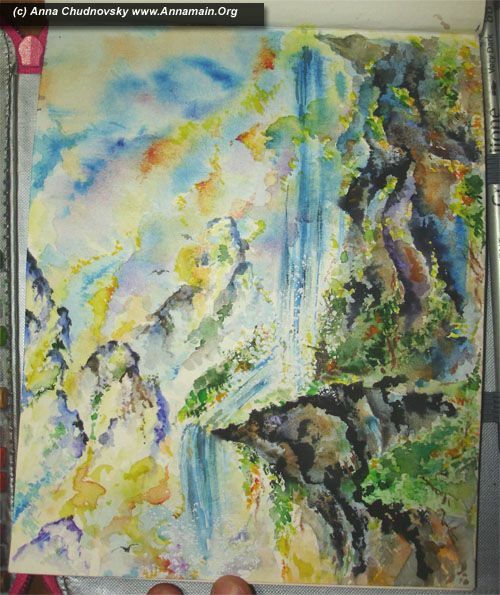 9 - use white colour to make points represents spray of waterfall. Point it everywhere you feel right! 10 - the last step is to allow people to see such beauty. Two small dark silhouettes near the waterfall let us to feel the picture better. Well, this is the end of the picture, but may be the beginning of your great travelling into intuitive knowledge. As you feel it try to relax and be in silence, be in consciousness, be waking, be a witness. This is the gift and the way to open youself for more colourful, more light life. Exactly! A creative job is like meditation and it gives us an intense feeling what makes us more involved in the task what gives a wonderful furnish of the job. I’m not a professional or expert painter but like to paint sometimes and I’ve used lots of water colors and it’s truly very interesting. Thanks for a nice painting.